A delicious recipe to make chocolate mousse with Greensweet Belgian chocolate, Greensweet liquid stevia and greensweet extra sweet. egg yolk which looks whiter. Then beat the egg white stiffly. Add the chocolate to the egg yolk and mix. Then spat the protein under the mixture. 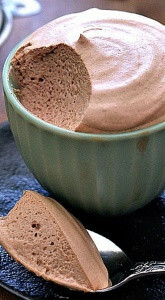 Put the mousse in nice bowls, cover them and let them stiffen in the refrigerator for a few more hours.